That we should be angry about the Roboski massacre should go without saying. Any act in a war that leads to 34 civilians being killed is an act that should lead to outcry and public condemnation. These are statements that it is difficult to disagree with, and it is certainly the viewpoint of Anders Lustgarten – one of the most overtly political playwrights working in a city whose theatre is often criticised for cleaving to closely to middle class sentiments for middle class audiences. Lustgarten should be applauded for his internationalist outlook. He has avoided more obvious events and has focussed on one tragic story that is difficult to shape within our traditional western media narratives about the war on terror. To fully understand the events at Roboski it is necessary to have a reasonable grasp of the history of the Kurdish people and their relationship with the Turkish state. Whilst it perhaps isn’t essential, it would also be useful to be aware of the PKK and the long-battle that the Kurds have had across the middle-east to avoid persecution in their adoptive homelands. It is quite clear Lustgarten knows what he is talking about, and that he has deeply held beliefs about it. The fact the programme notes he has been arrested by the Turkish secret police provides certain validity to the idea that in writing this play he has been speaking truth to power. Performances were excellent from across the ensemble cast and weighted with a powerful emotional charge; Aslam Percival Husain and Karina Fernandez in their roles as Kurdish villagers describing the fates that have befallen their kith and kin displayed an almost unwatchable dignity and honour in the face of tragedy. They were supported by staging that made a striking contrast between the flashy, technological toys of those with the political, military and financial might and a sparseness that fit with desolate mountain lands that the Kurdish people called their home. Given all of the above it is problematic then to report that I found the play an unsatisfactory experience. The reason is that I found there to be a frustrating lack of uncertainty within the play. It exists in a binary world where moral judgement has been predetermined. There is no sense that ambiguity can exist within the characters; in pen portraits of the CEO of an arms manufacturer, or of a Turkish journalist talking about the need to force Kurdish assimilation in order to safeguard the Turkish state, the argument is always presented as a fait accompli in favour of the prevailing narrative. 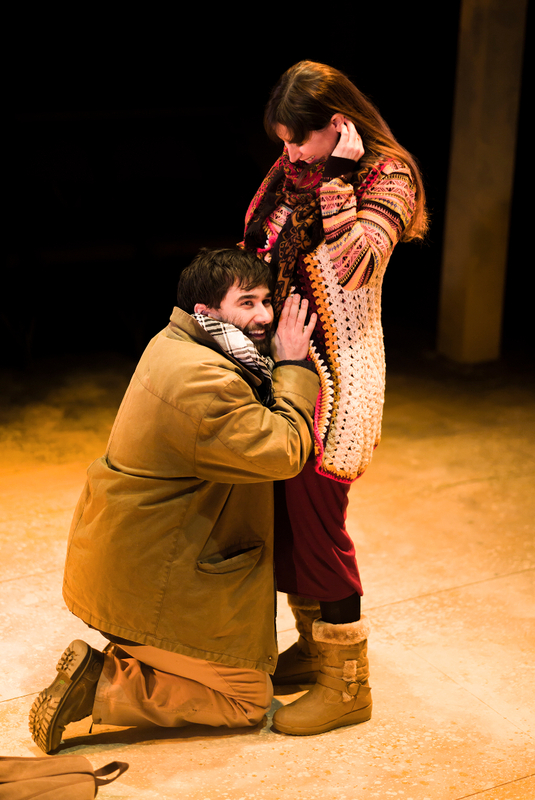 It is likely that most people who go and watch a play about the Roboski massacre are going to sympathise with the victims of drone strikes, and many may naturally side with the plight of the Kurdish people. I certainly did. However Lustgarten states in the programme that he wants his plays to force the audience to ask questions; I cannot help think that Shrapnel both asks the questions and provides the answers. The question of whether the use of drone strikes dehumanises war is a valid one. However there are many complex, ambiguous questions that are not even hinted at. For instance if we say that we should not use drone strikes – and accept the notion that war is sadly not going anywhere – then we must ask ‘what is a better option?’; do we say that the use of ‘precision’ targeted drones is a less preferable option to dropping Agent Orange over Vietnamese villages, which in turn is a less preferable form of warfare than dropping atomic bombs over Hiroshima and Nagasaki? And our these ‘remote’ vehicles of mass killing preferable to warfare using more ‘personal’ killing techniques that saw 60,000 British casualties on the first day at the Somme? A polemical play can be admired but it can also be wearying. Watching Edward Bond or Sarah Kane can feel like being physically assaulted but their plays sustain us because often they are wrapped up as allegories. We are drawn in by an unknown story and it is only as we sit trying to catch our breath do we realise that our viewpoints have been profoundly shaped by the experience. The realist nature of Shrapnel’s storytelling gives the play a documentary feel, and like many documentaries I found it impossible to ignore the unseen hand behind the camera that was directing my gaze. That said I don’t doubt that the world is an improved place because Shrapnel: 34 Fragments of a Massacre has been written. People should be aware that our tacit endorsement of the ‘war on terror’ has complex and far-reaching consequences. We live in a world that too often tries to find modern parallels in classic plays, in subjects that are written to appeal to a theatre’s core demographic and there is something inspiring to see a playwright wear their heart on their sleeve.